Explore Your Dark Side During HISTeria... Tampa's Premier Halloween Party! Explore Your Dark Side During HISTeria... Tampa&apos;s Premier Halloween Party! Hello everyone! This month is just flying by folks! Jerm here to tell you about an awesome party taking place next weekend at the Tampa Bay History Center! Grab your superhero tights and get ready for HISTeria, returning to the History Center from 8 p.m. till midnight on Saturday, October 22. 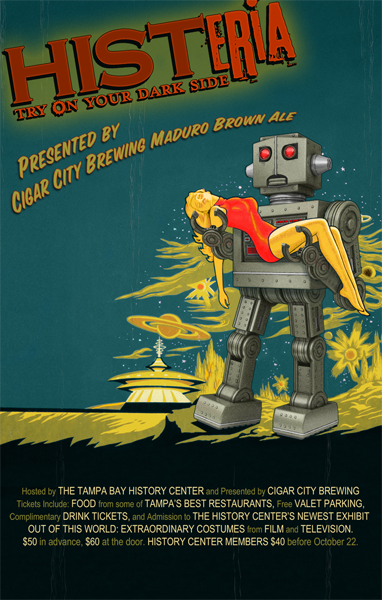 Presented by Cigar City Brewing, downtown Tampa&apos;s premier adult costume party promises to be even bigger and better than last year, featuring beers from Cigar City brewing and food from Datz Delicatessen, Café Dufrain, the Columbia Café, Pizza Fusion, Splitsville and more. Drawing on the History Center’s newest exhibit Out of This World: Extraordinary Costumes from Film and Television, HISTeria attendees are encouraged to wear costumes inspired by classic movies and kitschy television shows from the past. Be sure to get your tickets on the website or call the number above for more information! That&apos;s all for now and stay tuned in for more updates on Tampa Bay area events and things to do in Tampa Bay!